The half marathons and marathons got underway during March as well as lots of off road action and there are plenty of PB’s to report on. Terry Fullick completed the final race in the Minehead seafront 5k series on Wednesday 1st March in a time of 26.54. This placed Terry 2nd male over 50 for the series. Terry joined Harriers in October 16 and all of his times in this years series have been faster than last years. Great progress Terry. The first of the spring half marathons was the Bideford Half Marathon which took place on Sunday 5th March. This popular race takes in magnificent countryside alongside the River Torridge between Bideford and Great Torrington. The course is half on roads and half on the Tarka Trail and is moderately flat with one small hill section. Congratulations to Serane Stone on achieving a PB and first lady home. Super Sunday 12th March saw Harriers racing from Dartmoor to Spain (not literally!) with the Granite Way, Bath Half, Grizzly, Sidmouth Aquathlon and Barcelona Marathon all taking place. Steve Sirdefield traveled to sunny Barcelona and despite struggling with injury during his marathon preparations, Steve still managed to complete the Barcelona Marathon in a very respectable time of 3.48.54. Clearly not content with her new PB which was now 1 week old, Serane Stone secured a new half marathon PB of 1.20.09 at the Bath Half Marathon – fantastic result! Jeff Curd took part in the Granite Way, a 10 mile run along the Granite Way cycle path with fantastic views of Dartmoor and the surrounding countryside. Jeff completed the out and back route in 1.15.59. Hannah Brown – 6.52 swim, 10.08 run, 20.00 overall. Terry Fullick – 16.21 swim, 30.54 run, 47.15 overall. And finally 7 Harriers headed to Seaton to brave the 19 miles of mud, bogs, hills and pebble beaches that make up the Grizzly. What a weekend of racing! James Morrison completed the final fixture of the South Wales Winter Hill Series 2016-17 on Saturday 18th March. The final fixture took James to the Tor y Foel fell race (4.6 miles and 1,150ft ascent) in the Brecon Beacons. James finished 34th out of 75 in a time of 41:39. James competed in all 8 of the seasons fixtures, with the best 5 results to count. James finished 18th overall. A great performance from James. 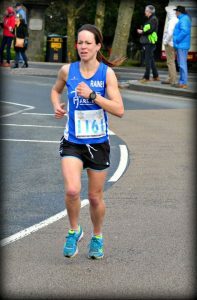 On Sunday March 19th Mary Humphries was the solo Harrier running in the Age UK 10k in Exeter. This race starts in the city centre and takes in the quayside. Well done to Mary who finished in 52.04. 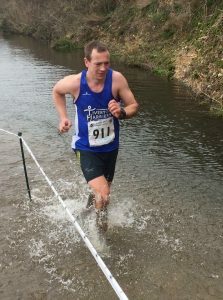 The final in the Westward Cross Country League fixtures took place on Saturday 25th March in Redruth and again we had a solo Harrier performance, this time from Ben Stone who ran in 36.11 in very soggy conditions which placed him 55th SM in the race and 37th SM in the series. Great running Ben. And last but not least, Jeff Curd completed the Yeovil Half Marathon on Sunday 26th March. This was Jeff’s first half marathon and he finished in a fantastic time of 1.44.13, demonstrating once again the great improvements Jeff has made since joining the Harriers. Congratulations to Jeff. A great month’s racing in a diverse range of events – well done Harriers!